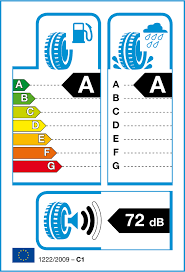 To help you make an informed choice about safer and more environmentally friendly driving, from 1st November 2012 all new car tyre labels will be labelled according to their performance in three key areas. The performance measures displayed on the label will rate the tyre’s fuel efficiency, wet braking performance and exterior noise emission. The graphics used on the labels are similar to those found on many new domestic appliances, cars and even buildings and are explained below. 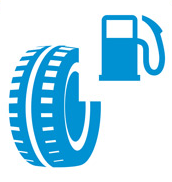 A tyre which is more fuel efficient helps you to reduce your driving costs and CO2 emissions. There are seven categories of fuel efficiency on the new labels. Category A is the most efficient and means you will use the least amount of fuel for your journey. Category G is the least fuel efficient. 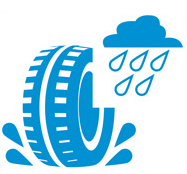 Wet braking performance is critical to your road safety as it affects how quickly you will be able to stop in wet conditions. Wet braking performance is also categorised in seven classes. An A-rated tyre provides the shortest braking distances on wet roads whereas a G-rated tyre will have the longest braking distance in the wet. The tyre’s exterior noise emission will be shown by a series of black waves. Three black waves indicate that the tyre produces the most amount of noise on the scale. One black wave indicates the tyre emits the lowest level of noise on the scale.